... the suggestion of a whole life with all its twists and turns of fate. Throughout their existence as a chamber music ensemble the Neue Vocalsolisten have shaped in particular two genres: vocal chamber music theatre, and the madrigal. In collaboration with present-day composers they transfer the historic form of the madrigal to a contemporary musical universe. Over the years the singers themselves have continuously expanded their specialized repertoire by commissioning numerous compositions and, in doing so, have brought back to life an entire music genre – an outstanding example of an artistic long-term concept and its realization. The four madrigals assembled on this recording demonstrate how admirably the soloist line-up, the chamber music performance, the density and the highly focused drama of the madrigal suit the Neue Vocalsolisten. Johannes Schöllhorn, José M. Sánchez-Verdú, Andreas Dohmen and Clemens Gadenstätter wrote these madrigals specifically for the ensemble. When listening to this music we experience how the reinterpretation of a historic form may lead us into new, hitherto undiscovered realms of music. **) As a download only available within the whole album. IOSIS is a scenic-musical collage, which deals with love, passion, force, pain and death and fuses new with old music to an expressive entity! 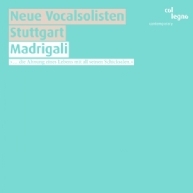 Quando stanno morendo (1982) and other Vocal works Neue Vocalsolisten Stuttgart re-release, finally available again!